There are many shopping and dining options available in the Blackheath area. Anonymous….. Beautiful Campos coffee in a Surrey Hills style cafe. Meet Me at Matt’s….small garden cafe in Wentworth Street. Specialise in Gluten Free and Paleo snacks. Kids always welcome…toys and play area. The Wattle Café….. local owners serving beautiful Morgan’s Coffee and nice food with a log fire in Winter. Blackheath General Store Cafe….Cafe with a Country Style vibe, artistic gifts and Aga cooked treats and meals. Also agents for Aga stoves. Bakehouse on Wentworth…bakery is a cafe as well. 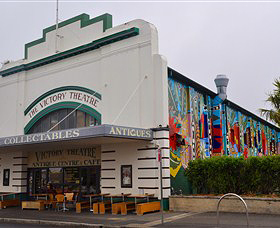 Victory Theatre Antiques…. via the Victory Café… made up of a number of stall holders.